Mother-Baby-Toddler Groups meet weekly and focus on the significant physical and psychological shifts that occur during this transitional phase. The change from baby to toddler is marked by the achievement of motor milestones, the emergence of language, interactions with peers and an expanding sense of self. 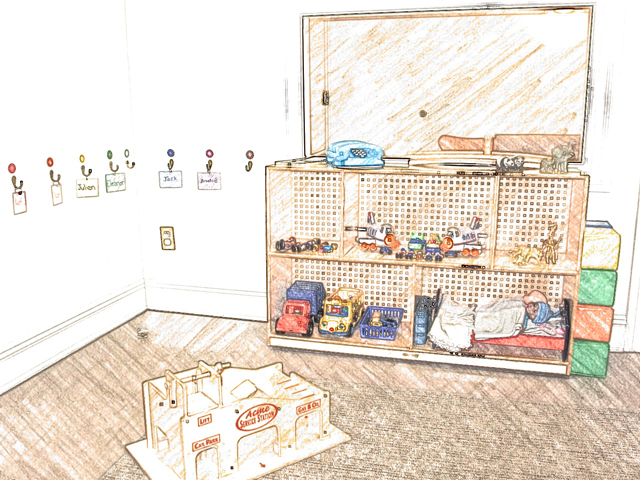 This playroom is organized to reflect both a toddler's increasing autonomy from, and growing attachment to, mommy. While the children play, mothers observe and interact with them and at the same time discuss child development and parenting. Play Group leaders facilitate the children's play. Play activities include manipulative toys, singing, story-time, art activities, early pretend play and beginning group play. Discussion topics include: the developing sense of self, eating and sleeping, pacifiers, weaning, treasured objects, the importance of symbolic play, reactions to separation, fathers and babies, the first "no's" and learning to wait. There are 6-8 mothers and children in the group. Mothers' discussions are led by Ilene Sackler Lefcourt. Play is facilitated by Alyson McCormick and the play staff.